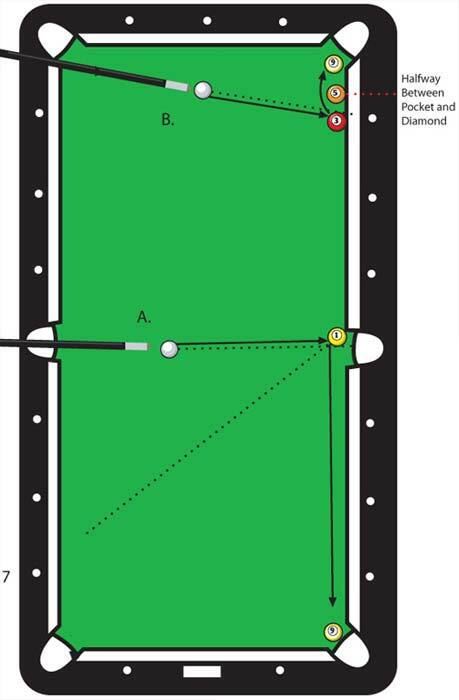 Freeze the 1 ball against the tip of the side pocket in a direct line with diamond no. 7. Place the cue ball in the exact center of the table. To make a billiard on the 9 ball is almost a sure thing. Shoot the center of the cue ball at the extreme outer edge of the one ball with top english. Do not hit this shot real hard nor real easy. Once you accomplish this shot, you can place a ball in the path of the cue ball and arc the cue ball around it. Shoot shot B. very easy. Sometimes it is advantageous to double kiss one ball frozen to a rail in order to make another. Top english arcs the ball forward in the two illustrations above.